d away in a small corner of sprawling Anyang City just south of Seoul, Korea, is a living example of how Koreans and non-Koreans can work together to bring about positive change in the community. The quiet alleyways of Seoksu 2-dong are dotted with rickety stalls, with whole dried fish hanging from hooks, and buckets overflowing with grain. 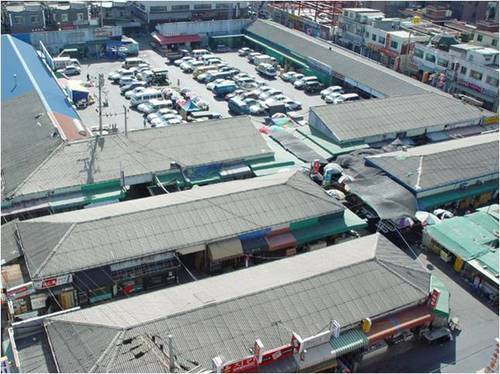 This is Seoksu Market, a traditional Korean market that is being eclipsed by the increasing presence of large supermarket chains such as E-Mart and Home Plus. In the 1970's, when the area was still a village surrounded by rice paddies and streams, the local government proposed to relocate bustling Central Anyang Market here as part of its urbanization plan. Some 120 spaces were constructed, but the majority of vendors refused to move. Because of this, the market failed to launch and only 30 spaces were occupied, leaving the rest vacant. After limping along for the past 30 years, it is now dying a slow death. Enter Chan-eung Park. An artist who grew up in the area and who now occupies a studio in the market (the Stone&Water Gallery), Park witnessed the hardships suffered by local businesses and the disintegration of the community. 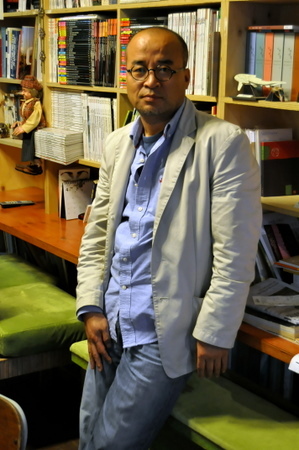 Rather than ignoring the problems, he created an opportunity to use art to revitalize both. 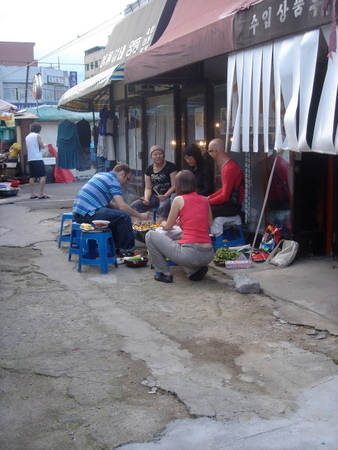 In addition to Stone&Water, Park created the Seoksu Art Project ("SAP"), a unique three month-long residency program sponsored by the Korean Arts Council and the Gyeonggi Cultural Foundation, that brings artists from all over the world to work in the vacant lots at Seoksu Market with the hope that the artists can breathe new life into the community. Through gatherings, exhibitions and shows, locals and artists alike were able to engage in interesting and unique cultural exchange. "I wanted to spread a cultural virus, one that was all about art," Park said. "My motto is that 'Art is Life, Life is Art.' 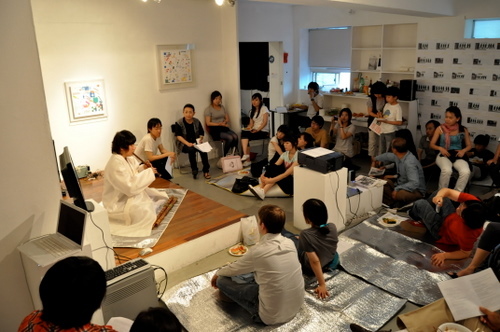 So, I want to unify public art education, public art, and ecological art under the umbrella of the Seoksu Art Project." As a progressive man, Park understands the importance of merging the global and the local, and the symbiotic relationship this creates. "I believe that artists are not separate from nature -- artists are like migratory birds -- they need to move around for survival and for inspiration, to experience different ecologies, or local cultures," he said. Nick Spratt, an artist from New Zealand who participated as a resident in the Seoksu Art Project in 2007 along with his partner and ceramicist Lauren Winstone, was first attracted to the residency because of the interaction it offered with the community. "A huge part of our interest was the residency itself -- the idea of working within a market-place and the chance to develop projects with the community there. TheSeoksu Art Project is a really unique type of residency because it puts artists into direct contact with a community and straight into an incredible cultural exchange. Using a studio based in an empty shop in the market place we were given access to a side of Korea that we would probably never have otherwise had the opportunity to experience,"Spratt said. In addition to creating relationships with the vendors, they also found inspiration in quirky aspects of Korea, such as the all-purpose use of linoleum and stumbling across street furniture cobbled together with a range of materials. As part of their residency, they decided to make their own furniture out of linoleum and gave it away to locals and stall holders, but only if they promised to keep in touch and show the artists how they were utilizing the furniture. Spratt explained, "The market was an intense and yet incredible place to be. I n some ways it was really hard: struggling to learn the language, having days when it was just too hot to work, or times when the smells could be just overwhelming. But in so many other ways, we felt extraordinarily fortunate to be there: experiencing the kind of place that is so dynamic compared to sleepy New Zealand, getting to know the stallholders and sharing in their daily lives." Although the market's demise may be inevitable, Park sees that the presence of the artists in the area is having a positive effect on the community. "People in the area would rather have economic help, but artists don't help the economy. However, the locals have begun to change -- they're volunteering to help out, they're interested in what we are doing." Not one to give up easily, Park has brought changes -- now Korean artists can rent out the spaces permanently very cheaply. Very soon, the International Volunteer Program through which Korean and Russian students can come and work artist assistants, will begin. Stone&Water is also a meeting place for the local expat community who were brought together through their love of art, music and mingling. 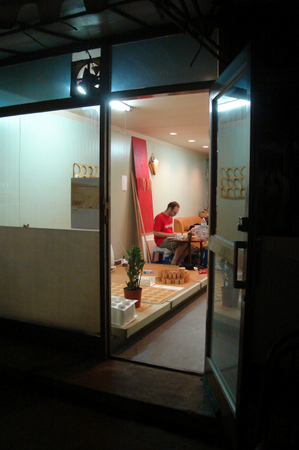 Ryan McLay, a Canadian artist and public school teacher residing in Anyang recently held an exhibition there. "Stone&Water has become a big part of my life. I go to the openings and closings and I've met some great friends and connections through there. We are all united by our love of art, and that transcends cultural and language barriers." For more information on Stone&Water gallery and the Seoksu Art Project, visit their website at www.stonenwater.org. This summer's residency will host artists from the United States, Croatia, France, Vietnam and Chile.